When it comes to knowing everything there is about any heavy weapons' ordinance, Crossfire has the rest of the Army over a barrel. As a kid, he was more interested in how a toy gun was made rather than playing with it. Needless to say, Christmas morning at Crossfire's house was one big menagerie of parts and pieces spread out on the living room floor. When he was eight years old, his father took him to visit an uncle at Fort Bragg, where they chopped down trees with Quad-50 machine guns! Crossfire was instantly mesmerized by these surroundings. The Base Command's Sergeant Major was so impressed with Crossfire's persistence that he took him under his wing and personally instructed him in some of the finer things in military life . . . such as how to assemble and disassemble various types of small arms weaponry in the dark. Nowadays, keeping the barrel of his weapon hot and spitting out lead is Crossfire's idea of having a party. No noisemakers necessary-Crossfire brings his own! When the heat is on, the G. I. Joe team calls in Double Blast to add just the right amount of firepower to leave COBRA shell-shocked! This guy is so knowledgeable of handheld weapons that he can take apart, repair, and reassemble a jammed M-60 machine gun in less than 60 seconds-in the dark. Incredible? Yes, but that's why he's a G. I. Joe! A jack-of-all-trades, Double Blast can fix anything with whatever is in his reach. As a kid, he once repaired his mother's broken vacuum cleaner with a rubber band that someone shot at him in school that day. It never worked better and hasn't broken down since. In college, a professor's botched electrical experiment had everyone baffled, except Double Blast. He corrected the error with nothing more than a ballpoint pen and a thumbtack. That got him an A in the class-and a visit from a G. I. Joe recruiter. Leading his squad of gunners against advancing Cobra forces, Double Blast often relies on the element of surprise in his attack strategy. 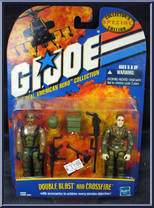 And Cobra never knows what hit them-only that Double Blast called the shots! Contribute pictures, update details or suggest corrections for Double Blast / Crossfire. Write a review about Double Blast / Crossfire.